Liberty University alumna Juli Peak made the leap from teaching in Amarillo, Texas, to creating her own business of gourmet foods when she discovered her talent for mixing hot cocoa flavors and developing unique recipes of cider, tea, cocoa, coffee and popcorn. She called the business Snookie Snookerwitz after a nickname her father gave her. The shop is currently located at the Lynchburg Development Center near Graves Mill Road. 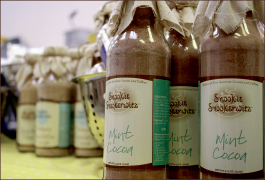 Snookie Snookerwitz sells a variety of types of cocoa, including frozen chocolate cocoa, cinnamon cocoa and original chocolate cocoa. In addition to cocoa, the shop also sells coffee flavors such as hazelnut mocha, peppermint mocha, vanilla mocha and vanilla caramel latte. Snookie Snookerwitz’s selection of teas includes chocolate chai, spiced cider, spiced chai and vanilla chai. All drinks come with directions on the bottles for preparation as hot or cold beverages. Along with specialty drinks, Snookie Snookerwitz also offers an assortment of popcorn flavors, including chili-pepper popcorn, cinnamon-toast popcorn, classic kettle corn, jalapeno-cheddar popcorn and salted buttercrunch popcorn. While the original idea was hers, Juli Peak is not alone on her adventure with the business. She and her husband, Kevin Peak, became a team soon after they met in 2006 while studying at Asbury seminary in Wilmore, Ky.
“As our relationship grew in those early years, we realized that we complemented one another as a hope-giving team to those who were hurt, stuck and broken,” Kevin Peak wrote on the Snookie Snookerwitz website. According to Juli Peak, what makes her business so unique is that all of her products are tailor-made. The Peaks believe that their beverages and popcorn snacks can be very beneficial for students, especially since all of their products can be ordered online and delivered by mail. While Kevin Peak notices the practicality of the products, Juli Peak keeps the fun of their unique items in mind. Juli Peak first developed the business’s basic products in Texas before moving to Kentucky. In 2007, the couple then moved to Virginia, bringing the business with them, and in 2009, Juli Peak began working on a master’s degree in counseling at Liberty. She graduated in September 2012 and is now a counselor who is working on her licensure in addition to running her business. Though the business is beginning to take off, the Peaks view it as a way to connect with people rather than a way to make a profit. Snookie Snookerwitz will have work positions opening in the summer and welcome any Liberty students who would like to apply. 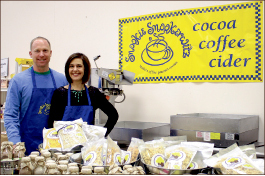 All of Snookie Snookerwitz’s products can be purchased individually or as gift baskets at snookerwitz.com. More information on the business and ways to contact Kevin and Juli Peak can also be found on the website.